In an electric mixer, whisk the egg whites to stiff peaks. Gradually add the sugar, one tablespoon at a time whilst the whisk is still turning. Finally add in a few drops of red food colouring and corn flour and whisk until well combined. The meringue mixture should now be glossy and resemble shaving foam. Remove the bowl and use a large spoon to fold in the chopped hazelnuts. 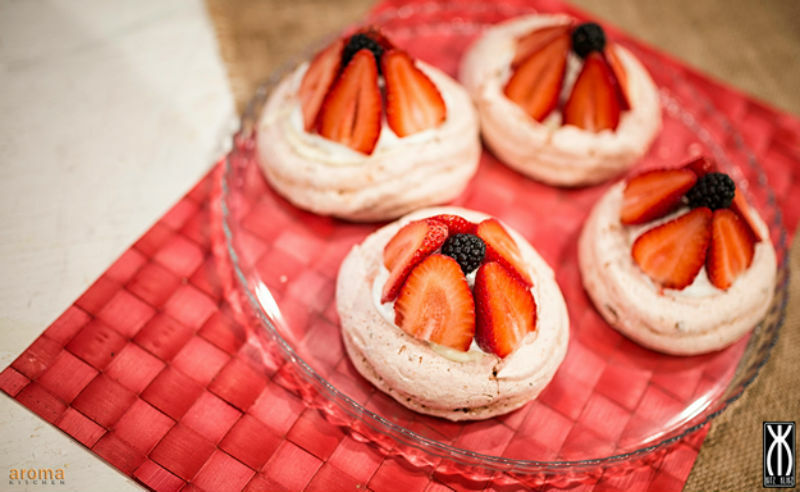 Place the meringue mixture into a piping bag and pipe into nests onto baking sheets lined with non-stick paper. Place the hazelnut meringues into the oven and bake at 130`c for an hour or until firm. Remove from the oven and set aside to cool. Once cool, carefully peel the paper from the bottom of each meringue. For the filling, whisk the cream to soft peaks then fold in the cold custard and the orange zest. Fill the meringue cases with the filling then pile in the fresh hulled strawberries. Finish off by glazing with warmed glazing jelly and serve.